Our first trip abroad was funded by your tax dollars – and we are grateful! 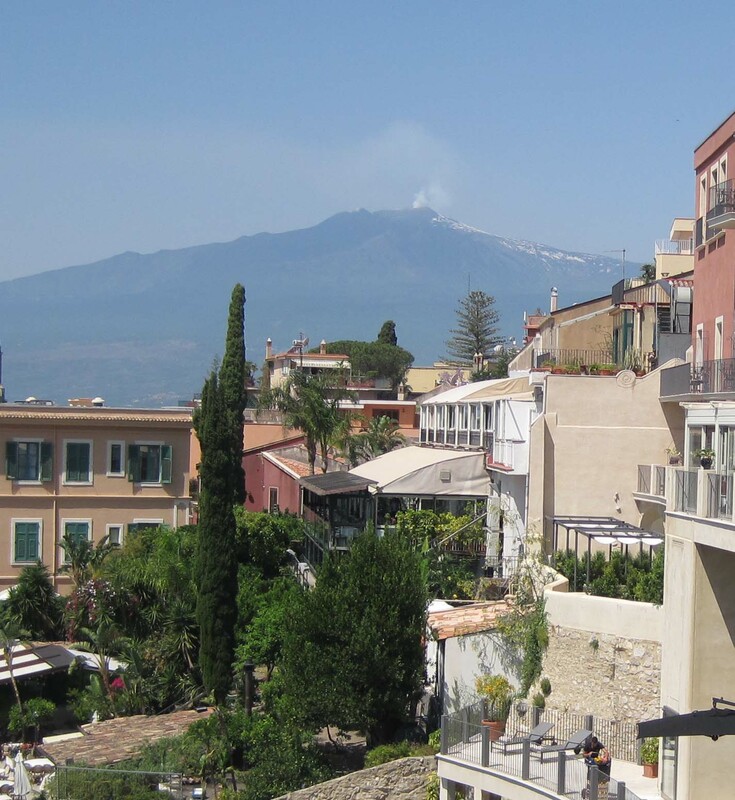 Shortly after we were married, my husband Perk was assigned a three-year stint of shore duty at Sigonella, the US Naval Air Facility at the foot of Mount Etna near Catania, Sicily.This sojourn established how we would operate the rest of our lives – Perk plans and organizes, I live in the moment. In preparation, Perk encouraged me to learn Italian; he suggested that we study together using books, tapes and recordings. I was a French major in college and tired of an organized study of language. I liked to talk, to communicate. I figured that I could simply add an “a” to my French vocabulary, change the accent, gesture broadly, and I would have a reasonable chance of being understood. Not being foolish, I learned a few key phrases that I knew would be vital. Perk studied – and as a navy disbursing officer, he focused on numbers, learning the currency and counting – and expected me to do the same. He worried about my lack of knowledge. How would I know how to count my change? After a fraught-filled trip to New York City (a blog adventure in itself! ), we flew to Rome and transferred to the domestic airport. We were hot, tired and apprehensive when we finally settled at the gate. I left Perk with the bags and books, found a kiosk and directed one of my key phrases to the attendant, “Dov’e la gabinetta? Where is the ladies room?” (I had also learned directions – left, right and straight ahead so that I could actually find it!) My needs attended to, I returned to the gate. I am so sorry that I do not speak your language. Do you speak English? Can you spare a moment while I look up my question in this book? After knowing you and Perk for over 20 years I am finally getting all those fun details that I DIDN’T know. Love it! Wonderful story….But, my first thought was the same as Brue’s….use the translator. You write so well. I look forward to reading of your exploits post ICED. I miss you. I am glad that you are doing this blog. I can hear your voice in my head and imagine your facial expression. Collette and Bruce are right, of course. And I do have the app and a handheld electronic translator, but I am a visual learner … a book helps me learn the language.